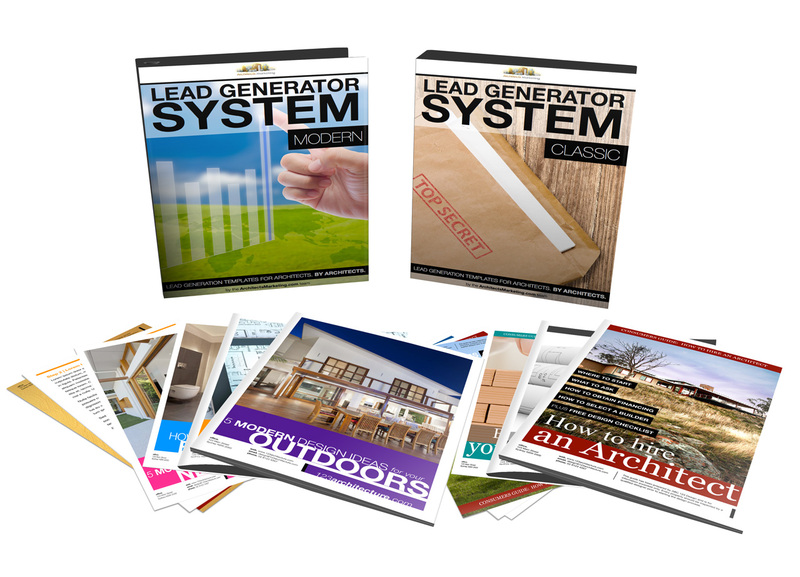 The Architects Marketing Lead Generator System is a new product from Eric Bobrow and Enoch Sears of the Architects Marketing Group. The product is comprised of a set of pre-made professionally written reports that you are able to use as-is or adapt as needed for placement on your website as “lead magnets”. We are in the process of developing the system, and have an initial set available for download in both Word and PDF formats. This product is included as a bonus for all new members of the Internet Marketing for Architects Course who sign up in December 2013. Members of the original IM for Architects Course (from 2012) may get access by purchasing the new 2014 course at a special reduced price – you should have received an email from Eric Bobrow with information on how to sign up. Active members of the 2013 Architects Marketing Coaching Program who continue with the Architects Marketing Mastermind Coaching in 2014 will also get access to these files.